As much as I love the artisanal places in the neighborhood (Caputo's, Monteleone's Bakery, Caputo's Bake Shop, Stinky Brooklyn) sometimes you need to do a good shop to stock the cupboards. Although Carroll Gardens lacks a quality supermarket, down on the water in Red Hook is the greatest supermarket ever created by man: Fairway. Fairway has every conceivable food item you could want under one roof, all high quality, fair prices, all in a beautiful old warehouse that is a stunning example of adaptive reuse. The problem is, how to get home with all those groceries? Even though Fairway will deliver your groceries, you still need to carry all the perishables with you. What to do? Assemblywoman Joan L. Millman again will be coordinating a free shuttle for neighborhood residents to the Fairway Supermarket in Red Hook. The shuttle will depart from the Eileen C. Dugan Senior Center, located at 380 Court Street, on Tuesday, October 9th at 10:00 AM and return to the Dugan Center at approximately 11:30 AM. Due to limited seating on the bus, shoppers must call Assemblywoman Millman’s office at 718-246-4889 to sign-up. Let's hope that Joan and Fairway can make this a regular amenity for the neighborhood. I learned some interesting things today; first from Ben's blog, that March 31, 2008 is the date that the MTA will submit it's capital budget for the next 5 years.AND March 31st is an important deadline for the Mayor's Congestion Pricing plan. We need the F express and ancillary enhancements in that capital plan. We need the congestion pricing plan to prioritize enhanced subway service in Brooklyn. This date is vitally important. Second, at the CB6 Transportation Committee meeting, a Ms. Haiman from the Office of Sustainability gave a presentation on PlaNYC and the need for congestion pricing. There I learned that the City has identified 24 problem neighborhoods, where an inordinate number of people drive into the Central Business District. One of those neighborhoods? Kensington! I pointed out that there is a simple, eloquent solution to that issue: restore the express service on the F line that services Church Avenue in Kensington. PlaNYC only provides for an additional bus route through Kensington; the correct solution is to restore the Culver Line (that's the F for non-transit geeks) to its former glory. Third, I learned from my Assemblywoman that her office has been receiving calls and drop-ins to advocate for the F express. The interest that all of you have shown is making a difference. Brooklyn's next, and first black, surrogate court judge. There is still the small matter of the general election, but in this race it was all about the Democratic primary. This is an important meeting. It's a great opportunity to point out that Brooklyn will need transit enhancements to mitigate the impact of Congestion Pricing. And what better way than to restore the F express and extend the V local to Brooklyn? Update from representatives for the Department of Transportation on the Downtown Brooklyn Traffic Calming Plan initiatives (Capital project HWK1153) already underway, and discussion of further needs for 4th Avenue corridor and environs. "Last week, Gersh Kuntzman’s Brooklyn weekly The Brooklyn Paper ran a scathing (and, in my opinion, very short-sighted) editorial entitled “Who needs an F express?” As you may have guessed from the non-too-subtle title, Kuntzman, supposedly a champion of Brooklyn, isn’t in favor of this added train service on tracks that have existed since these subway lines opened in the 1930s. Remember what we are fighting for: expanded service, express AND local, to Brooklyn. Come on, Gersh (newsroom@brooklynpaper.com), we could use your help. which affect limited sections of Carroll Gardens and Gowanus. candidate. It is a reminder to get out and vote! You can only vote in this Primary if you are a registered Democrat. The polls will be light tomorrow, so there will be no long lines! I, of course, am free to put my opinion in the mix. IND has endorsed Diana Johnson for Surrogate, and I'll be casting my vote tomorrow. If you're on the fence, I encourage you to do the same. Here's Sen. Velmanette Montgomery supporting Diana Johnson (courtesy Daily News' Liz Benjamin). Here's Daily Gotham's mole333 on the primaries in general, and noting that Johnson has the endorsement of IND, CBID, and Lambda. Show some love for a progressive candidate tomorrow. UPDATE: In case I wasn't clear enough - I endorse Diana Johnson in the election tomorrow. VOTE! The Daily News has a story out this morning on the MTA's plans to be more environmentally friendly. In other news, Ben at SecondAveSagas covers the news of more federal funding for the SAS and the East Side Access projects. Another kind of green . . . and the Senators need to keep it coming for the NYC transit that is a model fro the rest of the country. 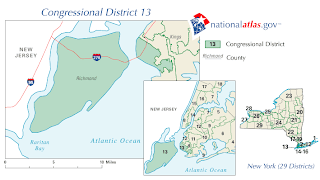 The 13th Congressional District encompasses Staten Island and South Brooklyn's Bay Ridge, Bensonhurst, Dyker Heights and Gravesend neighborhoods. Fossella, a Republican, has represented it since 1997. Recchia has been a steadfast supporter of enhanced service on the F lines in Brooklyn, specifically supporting the rstoration of F express and extending the V local. We need more transit supporters in Congress (and fewer Republicans). This is exciting news and we're delighted that Recchia will throw down with Fossella. Last time around, Steve Harrison gave him a good go, getting 43% of the vote despite being outspent 15-1 by Fossella. 2008 is going to be a bad year for Republicans, and this district may well swing to the Democrats. Harrison, by all accounts a solid guy, is also expected to run in 2008. One thing is certain: It's going to be an interesting couple of years in Brooklyn politics. While sleek new passenger trains streak through Europe, Japan and other corners of the world at speeds nearing 200 mph, most U.S. passenger trains chug along at little more than highway speeds — slowed by a half-century of federal preference for spending on roads and airports. The six-year-old Acela Express is the only U.S. rail line that tops the 125 mph considered "high speed" by international standards. And even supporters concede it barely qualifies, hitting its maximum 150 mph for less than 20 miles from Boston to Washington, D.C., and averaging just 86 mph over the full 456-mile run. Even so, Acela's ridership rose 20 percent in May as gasoline prices topped $3 a gallon nationwide, said Amtrak spokesman Cliff Cole. Nationally, Amtrak is poised for its fifth straight year of ridership gains this year, said Marc Magliari, a spokesman for the railroad. John Spychalski, a transportation expert and professor at Penn State University, says high-speed rail will continue to languish unless lawmakers provide the same financial backing as highways and air travel. He said some could be swayed if high-profile projects such as California's succeed. If you want to get depressed, just imagine for a moment that after 9-11, instead of attacking Iraq, we had invested $600 billion not in bombing another country, but in rebuilding our own infrastructure with a nationwide system of intercity high speed rail. Talk about a true investment in national security. What's done is done, but it's never too late to see some actual leadership. Instead of running around throwing money at BS "alternatives" like clean coal and ethanol, let's bring our investment in high speed rail up to par or better with the huge subsidies we give away to the plane and the automobile. Hell, if you must have your clean coal, at least use it to generate the electricity to run high speed rail. Rail could be superior to air or auto transit on many inter-city routes in the US, and is by far the most energy efficient. No conversation about "energy independence" should gloss over the fact that subsidized travel by plane and by car is the largest cause of our dependence on foreign oil. Reading this article reminded me of a post I saw on Daily Kos back in march on building a national high speed rail network. This has to be a national priority akin to the Eisenhower Highway System, and once again, national security is a compelling reason for doing so (but far from the only reason). 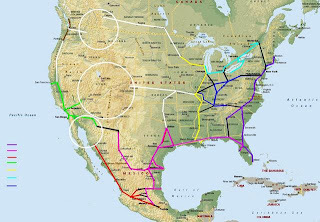 Searching for that post, I stumbled upon this post, which ups the ante by laying out stages for construction and integrates with Canada and Mexico for a North American rail network akin to the one in Europe. The map above comes from that post by seaprog. Elect a Democratic President and we might actually get this started. Man, you need to do an interview with Assembly Member Jim Brennan so that he can explain to you why a restoration of the F express will NEVER happen on his watch. I suggest that you go talk to him and report back. Far out, man. Buzzkill! That was quite an assertion, but since I asked for some clarification and never got it, I didn't take it very seriously. I had also heard from various people, that Brennan is a straight shooter, a shining example, honorable, etc. Eventually, curiosity got the better of me and I called up Brennan's office. Turns out, Jim Brennan CAMPAIGNED on restoring the F Express back in the early 1980's. However, apparently vibration and property damage in the Windsor Terrace area have been a serious concern among some of Brennan's constituents. This led to moving the F express to a back burner, and focusing on getting the MTA to correct the vibration issues, with some results, but persistent problems for many properties along the line. The problem seems to be that the line runs too close to the surface in this swath. My response was, we can fix the vibration problem with better tracking and trackbed; restoring the F Express still needs to be a priority. for your efforts to raise this issue. That's one more elected official on board the F Express. I think Brennan's idea of testing the express tracks out before the Viaduct project gets under way is sound; if the trackage will need a major overhaul, let's get that out of the way while the Culver Viaduct rehab is under way. You (probably) heard it here first. Michael Rundle has a piece in today's Metro paper on the possibility of an F express including a quote from yours truly. It's a good piece. Ben at SecondAvenueSagas also has a post up on the F express, and of course, the inimitable Gowanus Lounge has the definitive meeting coverage. Actually, GL's meeting coverage spans an incredible three posts, but the other two posts concern 360 Smith, which we'll get to in another post today. The news from the meeting was generally good. First, if the Culver Viaduct rehab is significantly delayed (a year or more) the MTA is looking at implementing interim express service. That's a big deal. Second, and most significant in my view, is the MTA is seriously looking at restoring the F express after the Viaduct rehabilitation. Before the community voiced it's demand, and the elected officials and media devoted a great deal of attention to this issue, restoring F express service was not even on MTA's radar screen. Now, I am fairly confident that it is going to be a reality. We need to maintain pressure to make sure that the reality includes expanded local service to accompany the coming express service: the F express and V local. In another news, another elected official has cautiously come out in favor of the F express: Assemblyman James Brennan. More details in the next post. I've been a casual Giants fan all my life, and been to the occasional Jets game as well. Typically, I don't get that excited about new stadiums, because it's difficult for me to look past a poor use of public money to subsidize wealthy team owners. (As is virtually always the case). Curbed has a rundown with links to today's NYT story and more renderings. 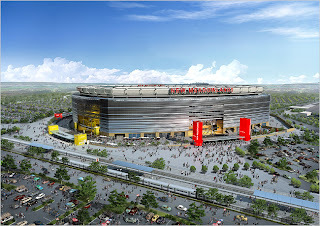 But the renderings for the new Meadowlands complex do get me excited about one thing: prominent rail access to the stadium. 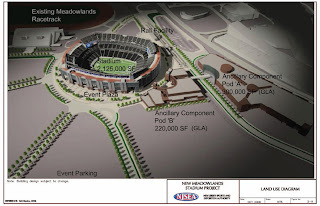 In the new renderings at top and bottom, you can see that their is a new NJ Transit facility right next to the new stadium . . . a big improvement. Plenty of people will be able to meet car-commuting friends to tailgate in the parking lots. I imagine that the new Xanadu complex will also have some sort of beer garden or sports bars (or both) that will be serving up pre- and post-game fare as well. So, there is a ray of sunshine in this giant boondoggle in the Meadowlands: at least it will be accessible by mass transit.